This is the first game in the Galaxian series. For other games in the series see the Galaxian category. In 1978, Japan's 100-yen coins were diverted away from the usual pachinko parlors to a little phenomenon known as Space Invaders. Meanwhile, the manufacturing company known as Namco was experiencing their own success distributing arcade machines. They decided that not only could they make a Space Invaders-type game, they could expand and improve upon the formula. And so in 1979, Galaxian arrived, and succeeded in stealing away some of the yen from Space Invaders thanks to its improvement in color technology and increased complexity. It was the first game from Namco to run on a Zilog Z80 processor. Galaxian is officially the first video arcade game to produce true RGB color. All color arcade games prior to Galaxian faked the color by applying colored strips to the screen of a black and white display. Galaxian expanded on Space Invaders by allowing aliens to break away from the formation and go on bombing runs directed at the player. This resulted in far less predictable game play that required an element of skill in addition to strategy, and would spawn a total of four arcade sequels by 1995. 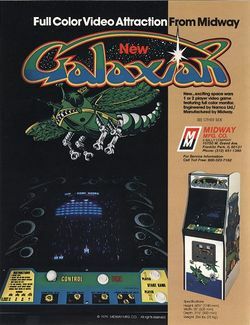 Compared to many early arcade hits, Galaxian took a long time before it appeared on the home scene. After converting Space Invaders and Namco's own Pac-Man, Atari finally took it upon themselves to license Galaxian in 1982, when they released it for their own systems, and developed the game for competing systems in 1983. After the classic gaming era, Namco developed ports of the game for the MSX and many early Nintendo systems. These days, conversions of the game are typically found on Namco Museum compilations for the Sony PlayStation, along with several others (some of which were originally Japan-only). Note: waiting at the title screen will have the game scroll two lines of "story": "We are the Galaxians. Mission: destroy aliens" as the aliens' point values appear underneath. The player's designation as a member of the Galaxians has since been retconed. This page was last edited on 17 November 2013, at 04:22.